Back in 2007 I participated in PyWeek 4. The results of that contest were a game that I "released" called "Busy Busy Bugs". 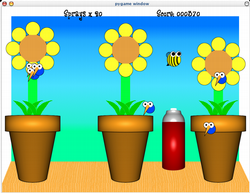 The premise is you are a spray can of insecticide trying to keep bugs away from your plants. Every time they attack your flower it "droops" a little more. There's also a little bee that comes by and "gives life" to your plants. It's a silly little game and I only coded 20 levels for it. But one of the pieces of feedback has stuck with me. I've considered giving this another go for several years but for whatever reason haven't. But since I can't come up with anything else that sticks I figure now is the time to give this little game the 20% polish it needs to be a great game. Part of this return was because of a Lewis Pulsipher class that I'm taking where it states that you're not a real designer until you've properly released a game. Since this never got the proper release I think it deserves it's high time that I give it the attention to "finish it" and move on to other ideas. So, 6-7 years later this thing will be finished. Released. Done. It'll be code that I'm proud to show folks.